The despot of the Serbs, George Brankovic, permits the 'noble great eparch (celnik) of my realm, Radi ' to make a gift to the monks of St Paul's Monastery. The gift consists in the transfer of the village of Gornya Peshtsanitsa in the district of Branitchevo, which had been part of the despot's patrimonial estate and was transferred to Radic by Brankovic himself. The despot now permits the village to be given to the monks of St Paul with all its territory and rights. As long as the despot and his children live, the gift shall be inalienable, and no-one shall have the right to revoke it. The despotic order comprises 33 lines of calligraphic text in the Serbian script of the Resava School. The ornamental red initial capital is preceded by an ornamented cross. There are also red initials within the text. In the lower part of the document there is the signature: 'By the mercy of God, the master of the Serbs despot George', together with a piece of red braid passing through a wax seal 8 cm in diameter, bearing the coat of arms of the Brankovic dynasty surrounded by the inscription: 'In Christ the Lord, the faithful and Christ-loving master of the Serbs and the Cisdanubian territories, George'. 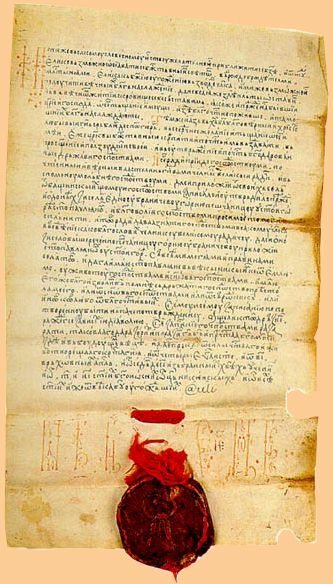 The document is undated, but an approximate dating may be reached on the basis of other documents connected with Radi. Bibliography: Stojanovic 1890, p. 5. Novakovic 1912, pp. 531-2. For a correct reading of the seal, see Sindik 1978, p. 196.